Wrecking now Toyota Surf Hilux with all parts available. Toyota Surf radiators, alternators, starter motors, axels, rear and front divs and so on. Since the early 1980′s the Toyota Hilux Surf has established itself as a dependable off-road vehicle in New Zealand. A popular mid sized pick-up, the Surf has a wide- ranging capability, from towing boats to the general transportation of goods, as a sturdy workman’s vehicle. The parts are highly sought after. From the Surf’s beginnings as the ‘Trekker’, a hybrid truck and sport utility vehicle that was based on the Toyota Hilux. It has undergone notable development into a mid-size, off-road vehicle with it’s own loyal following here in New Zealand. The first generation (1984–1989) emerged from the Toyota Hilux’s short-bed pickup body but with an added removable fiberglass top, hugely popular with the subsequent generations and continually being evolved and refined. 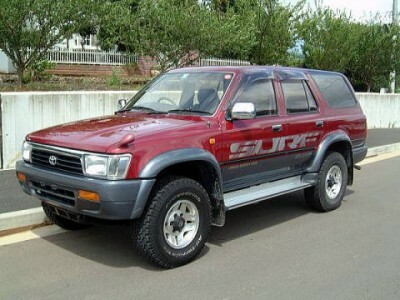 To date there have been 5 generations of the Toyota Hilux Surf (or Toyota 4Runner in some markets). Various changes include the 1st generation 1986 model originally having independent suspension (torsion bars) fitted to the front, and the fibreglass rear section replaced by an all steel integrated shell in the 2nd generation. This body shell being completely redesigned, keeping with the current pick-up models of the time. The 4th Generation is slightly larger, and is available with a choice of new suspension designs and 4WD systems to enhance off-road abilities. Popular parts include headlights and taillights (due to the amount of city work these cars can get), brakes, radiators, alternators, seats, brakes, radiators and alternators. Now a full SUV, the Toyota Hilux Surf is a renowned vehicle, gaining a reputation for exceptional sturdiness and reliability, even during sustained heavy use and/or abuse, and is often referred to as “The Indestructible Truck”.